In his talk Ian argues two important points when considering where unit testing has gone wrong: firstly that we are testing the operations in classes / methods rather than the behaviours of the system, and secondly that our tests have become strongly coupled to the implementation detail. High unit test coverage should give us the confidence to refactor the system, knowing that if we break the behaviour the tests will tell us. Instead this coverage in an impediment, it slows down development by adding cost to every refactoring exercise we do. Each class is tested separately, with it's dependencies mocked out, so AddressController would have a mock UserService, the service would have a mocked UserRepository and so on. The advantage here is that when writing tests we can focus on the logic contained in each separate class, with a view that by testing each piece behaves as expected we will have a higher degree of confidence that the system works when fit together, assuming we also apply prudent integration & system testing. However in this approach lies the biggest issue, each test fixture is coupled completely, even in name, to the implementation detail. In this scenario, let's say I think getting an address shouldn't really belong in the UserRepository, it should have it's own repository called AddressRepository. So I refactor the relevant methods out, what happens next? It's important to note here that at no point have I changed the behaviour of the system, yet a simple refactoring of splitting a repository has required a sweeping set of changes to my tests. Frankly my tests shouldn't give two shits how the code works under the hood (white box), all it should care about is how the system is expected to behave at it's extremities (black box). The AddressTests in this scenario should mock 1 thing and 1 thing only; the database. Everything else should be a concrete implementation (more on achieving this in a bit). The tests themselves should then be concerned with setting up the database mock with the test data required to service a request to the AddressController. If this is a CRUD endpoint the tests would also verify this data is correctly modified by the requests at the database level. What happens when we refactor again to add our AddressRepository? AddressTests still has a compile error, we've added a new dependency AddressRepository that needs to be passed in to the AddressController. However now to update the tests we only have that single step of adding a concrete implementation to the controller in the tests, everything else stays the same. This gets us closer to the "holy grail" of unit tests, where the tests are protecting us from unintended behaviour change whilst letting us freely change the implementation detail underneath. We're not quite free of implementation detail yet, there is still one more step that will allow us to refactor freely without touching the tests. The Core Registry defines the internal logic of the component and should be accessible to both the component and test projects; everything in here will be provided as a concrete implementation to the tests. The Boundary Registry defines the external dependencies of the system; so I/O, logging, API clients, databases etc. This should be accessible to the component project only. 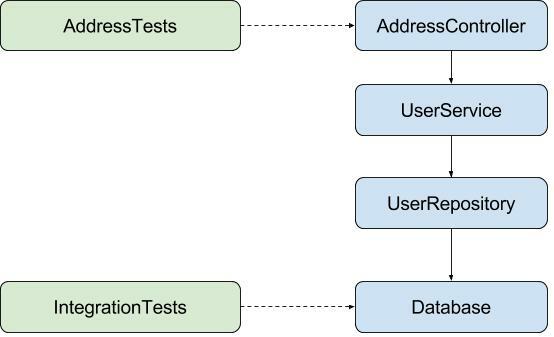 The test project then defines it's own registry that provides mock versions of the external dependencies for all tests. Now when we refactor code internal to the component the tests should remain unchanged, as they are using the same DI registry as the application. We implemented this approach at Careflow Connect having hit a lot of the issues stated earlier. As the company grew and the software became more complex we wanted to refactor and restructure more frequently, yet found working through the treacle of strongly coupled tests, that in places seemed to have little value, a constant frustration. 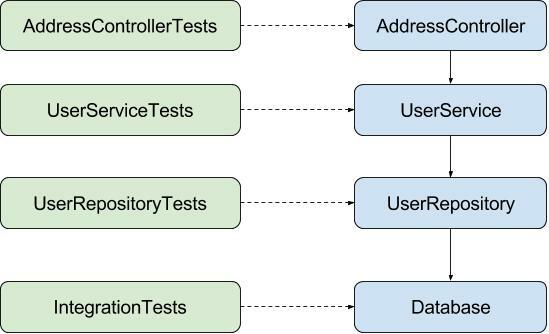 We ended up with libraries of tests that focused heavily on the expected behaviours of the system whilst providing more value as each test covered all the code from the edge of our public interface (controller level or the edge of a client library) down to the external dependencies. This lead to suites of tests that looked and operated like feature / system tests without the overhead of running in Selenium and persisting test data in a concrete database. Further to this the tests felt "purer" as they only tested the inputs and outputs of the public interface along with the side effects of any dependencies. It really works! Refactoring becomes much easier as the tests give you the safety net of knowing if you've broken the expected behaviour. We could replace all the internals but so long as we maintained the external contract and outputs to external dependencies the tests required no extra work. Setting up test data gets harder, much much harder. When isolating a single class, assuming you've heavily applied SRP, it's quite easy to mock the responses required for methods to function. When you're dealing with concrete implementations right down the stack, you start to have to add all the data required for the flow to work normally. In our example of a AddressTests we may have to not only add an address to the mocked database, but ensure any authentication against the user is provided, the user has the correct priviledges to perform CRUD operations etc. Please let me know what you think of the blog, did I cover it in enough detail? Is there anything I've missed? As one of F#'s killer features; type providers have the ability to make rooms full of developers gasp when shown for the first time. Support has recently been added to the FSharp.